Would you trade in your collection for a subscription? The game industry is about to go through some pretty major changes, all centered around a new technology: game streaming. While traditional gaming meant owning a relatively high-powered console and buying physical discs for each game, the near future could bring libraries of unimaginable sizes that can be beamed straight to your PC or console – all for around the same price as a Netflix subscription. While this might seem like a concept that’s far from reality, it’s actually not. In fact, there are a few of these services already – and they’re pretty awesome. So much so, that many consider game streaming to be the next big arms race in the gaming industry and it’s a race that could change the industry forever. But before we dive into the past, present and future of this literally game-changing technology and how it could impact the next generation of consoles, let's explore the advantages – and disadvantages – of ditching the disc. There are plenty of advantages to subscribing to a game streaming service rather than buying discs or downloading games outright. For starters, streaming games means you don’t have to worry about owning the hardware necessary to process those games. Whether it be a console or a high-powered PC, gaming hardware isn’t cheap. Instead of having to own high-powered graphics cards, processors, and huge hard drives for storing all those games, you simply need to own the hardware necessary to display the streamed games - like a basic computer. Another advantage is the fact that game pricing is likely to change. Instead of the traditional model of buying an ultra-powerful console or computer, then buying games individually, you might be able to access titles Netflix-style through more affordable hardware, where you pay a subscription, then have access to a library of games that would otherwise cost thousands to buy individually. Then there are the downsides to game-streaming, however. While you may not have to worry about high-powered gaming hardware, you will need to ensure that you have a powerful enough internet connection to play games with as little lag as possible, for example. And what about letting friends borrow your games? How would that happen if everything exists in the Cloud? These are big questions that aren't going away anytime soon. If Microsoft and Sony make this the cornerstone of their next consoles, you can expect to hear these questions and dozens more like them in increasing frequency. Of course, some game-streaming services already exist – in a nascent form now, but they’re only getting better. Companies like Sony and Nvidia are still working on developing their services, and that’s unlikely to change in the near future. Here’s a quick rundown of the services available and what they have to offer. Nvidia’s GeForce Now has been a work in progress for a while, but now it seems as though the service is finally maturing ... despite the fact that it’s still officially in beta. Available on PC, Mac, and Nvidia’s Android TV device, the Nvidia Shield TV, GeForce Now is a little less about game curation and more about cloud processing. In other words, GeForce Now is aimed specifically at renting out the company’s ultra-powerful computers for processing your games. These computers run graphics cards like the Nvidia GTX 1080 – cards that cost an arm and a leg to own yourself. Currently, there are over 300 games supported by GeForce Now, and you can add your own games from your Steam or Uplay library, making it easy to enjoy an excellent gaming experience with all your favorite games. GeForce Now isn’t a totally painless experience but it is getting better – a process that’s likely to continue to happen as the company continues work on it and it finally comes out of beta. Unfortunately, however, there’s no word yet on exactly when that will happen. That said, currently GeForce Now is free to use, though you’ll still need to buy games through services like Steam. While it's free to use right now, there will most likely be a price attached once the service comes out of beta. 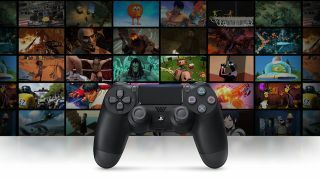 PlayStation Now, as the name suggests, is Sony’s game-streaming service specifically for the PlayStation 4 – though PC users can also make use of the service, provided they have a compatible controller. Previously, the service was also available on the PlayStation 3, PlayStation Vita, PlayStation TV, and some Sony smart TVs, though it has since been discontinued from those devices. While PlayStation Now doesn’t have access to services like Steam, it does have a pretty massive library in its own respect. Currently, there are over 600 games available for streaming from PlayStation Now, including PS4, PS3, and even PS2 games. New games are added to the service every single month, too. Unlike the Nvidia GeForce Now beta, PlayStation Now isn’t free – but subscribing also gets you access to the expanding library of games without having to pay extra fees. The service is available in North America for two pricing options: $19.99 for one month, or $44.99 for three months. In France, Germany, Belgium, the Netherlands and Luxembourg, PlayStation Now is available for €14.99 per month. While Nvidia GeForce Now and PlayStation Now are the big game streaming service right now, that’s going to change in the very near future. You didn’t think Microsoft would watch others launch game streaming services while it sits back, did you? The maker of the Xbox One, Xbox One S and Xbox One X has already announced that it’s getting into the game streaming game with XCloud, an upcoming service that will reportedly debut alongside the next Xbox – which goes by the name Project Scarlett. That ties into a larger rumor floating around that Microsoft is developing two separate Xbox consoles – one high-powered console that can be used like a traditional console and one streaming-only console that will feature more basic components aimed at handling controller input, video streaming, and so on. The new console is being developed now under impossibly tight embargoes, and rumors indicate that it will launch at some point in 2020. Of course, we shouldn’t expect it to be the only game streaming service on the horizon. While Microsoft is the next big one, eventually there will likely be other service to pop up, too. It’s possible Nintendo might get into the game streaming market with its collection of tried-and-true classic hits from the NES, SNES and N64 eras. While we'd love to tell you Nintendo has something in the works along those lines now, Nintendo has always walked its own path when it comes to the adoption of new technologies and it could be years before something even close to that comes to the market. While Microsoft is the next big one, eventually there will likely be other service to pop up too. Services aside, we may well see more hardware built specifically for game-streaming too. That’s a good thing as it means that the price of consoles could go down as games are increasingly processed in the cloud and then delivered to a user, rather than processed locally. The Microsoft Scarlett console may well be the first of these, but low-power consoles are nothing new. GeForce Now, for example, is available on Nvidia’s Shield TV – a basic Android TV device that comes with a controller. It’s a powerful device, to be sure, but nowhere near powerful enough to handle many of the games that it streams. Game streaming is almost certainly the next big thing in gaming. That’s a good thing for you – it means that you don’t have to buy powerful consoles or put together a gaming rig. Instead, you can divert that money towards a subscription to a game service and a relatively fast internet connection. While many will want to wait until more game streaming services are available, the streaming services currently on offer have a lot going for them. GeForce Now is a great way to dip your toe into the water of game streaming if you already have a decent Steam library, though you will have to wait to join the beta. One thing game streaming unfortunately won’t solve is platform-exclusivity. If Microsoft, Sony, Nvidia, and more all have their own services, then there will almost certainly be platform exclusive games – which means you may want to subscribe to more than one service. But hey, that's a heck of a lot cheaper than buying a second console to do so, right?